ONI Bureau: Malaysian airline Air Asia has launched its direct flight services from Bhubaneswar to Bangkok on Thursday. As many as 165 passengers left for Bangkok from Bhubaneswar yesterday night. 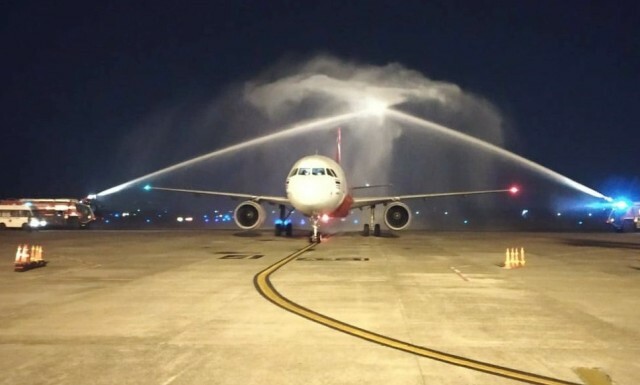 Similarly, the flight FD-112 from Bangkok, carrying 28 flyers landed at the Biju Patnaik International Airport (BPIA) at 11.35 pm and has given traditional ceremonial water salute. As per sources, flight services will be operated three days a week that is on Wednesday, Friday and Sunday from December 7, 2018 to March 30, 2019 at a promotional fare of Rs 2999 per trip. The flight will take off from Bangkok at 10.35 pm and reach the destination at 4.30 am. Similarly, the flight will take off from Bangkok at 10.35 pm (as per Bangkok time) and arrive in Bhubaneswar at 11.55 pm, reportedly.